Recently i have bought Nokia Lumia 900 with Windows Mobile Operating System. 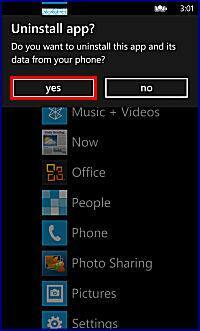 I have installed many Windows app in my Mobile Phone. Because of that my mobile getting slowed. Now, i wanted to remove some unwanted app from my Mobile?? How can i uninstall these apps in my Mobile? We can uninstalled windows applications that we wants to do... those applications are no longer use we can uninstall it to increase the amount of available memory. 1.Click on the start screen, select an arrow sign. It might be possible that some application may not be remove.otherwise selected applications will remove. Downloading apps is fun and usually great to boast about. But all this extra load takes a toll on your phone. A phone can't handle so much pressure. So it becomes slow and becomes a frustration to the user or owner.. So it is wise to delete certain unwanted apps. The following steps guide you how to do the same and increase that performance bar of your phone. 1. Scroll to the right screen. 2. You will see the list of apps. 3. Since you have installed many apps it is always a wise decision to run a search for it. 4. Tap on the magnifying glass symbol. That is search. 5. Type the name of the app that you don't want to have. 7. Tap for a long duration and a small menu appears. 9. The app is uninstalled. Note: you can always download the app again from market place. Now this shall increase the speed and performance of your phone..